We shared a lovely pre-Christmas concert with our friends Pentyr Singers at Helston Old Cattle Market, helping to raise over £600 for Cornwall Hospice Care. 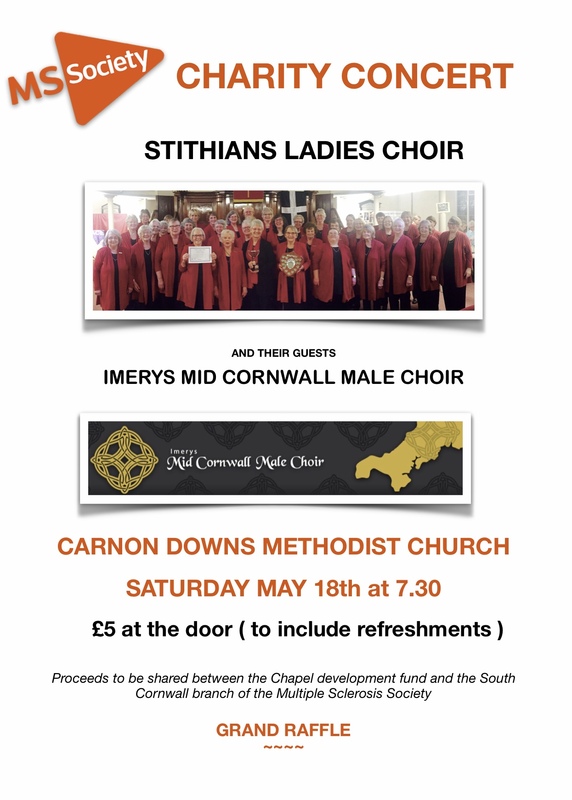 At the invitation of Mevagissey Ladies Choir we travelled to St Goran Church to share a concert for the Cornwall Air Ambulance. The Ladies were joined by Marazion MVC, compere Adrian Wilton and ‘cellist Becky McGlade to raise funds for The Cove Macmillan Support. The Choir shared a concert with Celtic Male Ensemble and raised £1000 for the Cornwall Air Ambulance New Heli Appeal. The Choir had a lovely few days near Barnstaple and shared a concert with Barnstaple MVC. We shared a fundraising concert with Pentyr Singers and Maia Roberts at the Catholic Church in Helston. We joined St Stythians Band and St Stythians Male Choir for the annual Carol celebration at the Stithians Centre. On a freezing night we gave a lovely concert at Budock Church together with The Saxy Maids. A large sum was raised in support of the Children’s Hospice South West. At the invitation of Edgecumbe Chapel we gave a lovely concert there. We had planned one at All Saints Church, Falmouth earlier in the month but we had to cancel because of a really awful weather forecast. Hopefully we will reschedule as soon as possible. 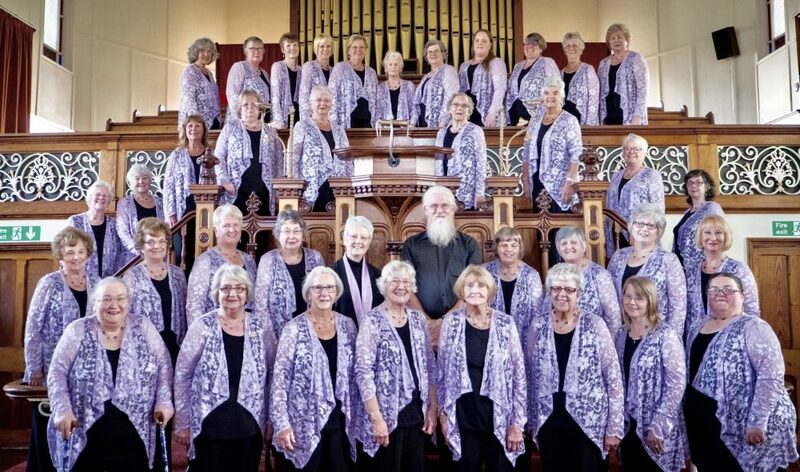 We had a photo shoot in order to update our choir photographs now that our numbers have swelled. It was supposed to be at Stithians Lake but the weather had other ideas so we went to the lovely chapel at Carnon Downs. The photographer was very patient and there was much hilarity! Our last concert of the Spring/Summer season was at Truro School Chapel where we supporting Penhaligon’s Friends, generously assisted by the Trengilly Singers and The Beatroots from Oxford. We shared a superb concert with Lostwithiel Town Band at St Bartholemew’s church Lostwithiel, where over £800 was raised in support of Cornwall Hospice Care. The Ladies waiting for the Ladies! Peter is a staunch supporter. A chat in the interval. We shared a lovely cream tea with present and past Choir members in celebration of our 60th anniversary. We presented another cheque for £1000 to the ladies from Marie Curie. This was raised at our concert with Holman Climax MVC in May. A little chat with the audience. We presented a cheque for £1000 to the Cornwall Down’s Syndrome Support Group following a hugely successful concert with Tamar Valley MVC. Our visit to the Penlee Lifeboat to present our cheque for £1000 which was raised at our Carols by Candlelight, Christmas 2016. I wonder what Chairman Peggy is saying to MD Bea to cause such hilarity? Margaret Haile, daughter of choir founder the late Sidney Bowden, shares her memories. Joan Biscoe, the first chairman of the choir, cuts the cake. Joan Biscoe delivers her witty speech. Goodness knows what our esteemed Chairman was saying! The young and the … errr … experienced? Bristol:- not taken by us! Photos from our concert at Camborne for Cara Coweth Water, Sierra Leone. Just to clarify …. Comments Off on Just to clarify ….